A division of Kanimbla International Trading​ Pty. Ltd.
Kanimbla Australian Coastal Shipping & Logistics is a division of ‘Kanimbla International Trading Pty. 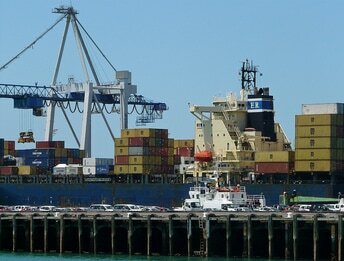 Ltd.’ and provides reliable Coastal Shipping Services and Domestic Freight Solutions within Australia. We place a priority on using ships to move cargo throughout Australia because it’s often more efficient, ecologically friendly, and cost effective than road or rail. However it is not always practical to use sea as the mode of transport, and we also utilise road and rail networks if and when required. Being at the forefront of domestic shipping and associated transport modes, Australian Coastal Shipping & Logistics offers a complete range of transport options anywhere in Australia. By using strategic partnerships we have the capability of carrying cargo between the major demographic regions, and also to remote rural locations that require servicing. Australian Coastal Shipping & Logistics offers the full range of domestic freight services for the movement of freight, both Interstate and Intrastate. Those options are; (i) Ocean Freight on a wharf/wharf basis- (ii) using rail from railhead to railhead- (iii) a Door/Door Service using a combination of road and sea, or a combination road and rail. In drawing on our 40 years of experience, our customer can be confident that goods will arrive on time every time in the most efficient and cost effective way.